WHAT IS LASIK/LASER VISION CORRECTION AND HOW CAN OCEAN OPHTHALMOLOGY ENHANCE YOUR EYESIGHT? Laser-Assisted in-situ Keratomileusis (LASIK) is an advanced refractive laser vision correction procedure for correcting near-sightedness, far-sightedness and astigmatism, potentially reducing your dependence on glasses and contact lenses. LASIK surgery and equivalent procedures (epi-LASIK, PRK) effectively and precisely sculpt the cornea to enhance your vision. LASIK is a comfortable, safe, and effective outpatient procedure with a number of important benefits including fast recovery. To date, approximately 32 million patients have undergone LASIK worldwide, making it the most common elective refractive procedure. Included in this number are patients from diverse age groups, with different visual needs. Through delicate reshaping of the cornea through LASIK, previously unfocused light rays are able to form a sharp image on the retina, and clear vision is attained. This step involves a thorough pre-operative examination and question and answer session with your LASIK surgeon. At this time he/she will determine if you are a candidate, and also perform special testing to determine your corneal “blueprint”. At the time of surgery, the next step involves utilizing a 150kHz femtosecond laser to fashion a thin, centralized flap in the cornea. Your LASIK surgeon then elevates this flap and applies excimer laser energy to your cornea, matching the previously obtained corneal blueprint. Finally, the flap is replaced in its proper position and you are finished! Dr. Pelletier performs LASIK surgery at the Bascom Palmer Eye Institute, ranked number one overall ophthalmology training program in the United States. Bascom Palmer has the most current, advanced versions of femtosecond and excimer laser technology. 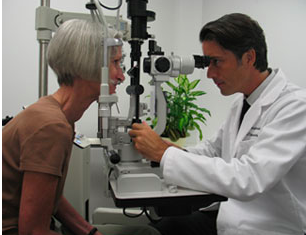 The day you have LASIK surgery you should relax; the friendly staff will accomodate your needs. The procedure is quick and should be over before you know it. Following the procedure, you should not drive; it is best to bring a friend with you or arrange for a ride (we can arrange that for you). After the first day, many patients experience significantly improved vision. Our criteria for the ideal LASIK patient is someone who is over 21 years of age, has healthy corneas and a stable prescription. Certain medical conditions, abnormally shaped corneas, excessively thin corneas, very high refractive errors, preoperative glare/halos or advanced dry eye, and pregnant and nursing women are often reasons for relative or absolute contraindications to LASIK. Candidates should also have a good understanding of the risks and rewards from LASIK surgery. The best way to find out if you are a good candidate is to arrange for a complete eye examination at Ocean Ophthalmology Group. You will know in minutes whether this procedure is right for you. During the evaluation we will answer any questions you may have and discuss your expectations. We look forward to meeting you.